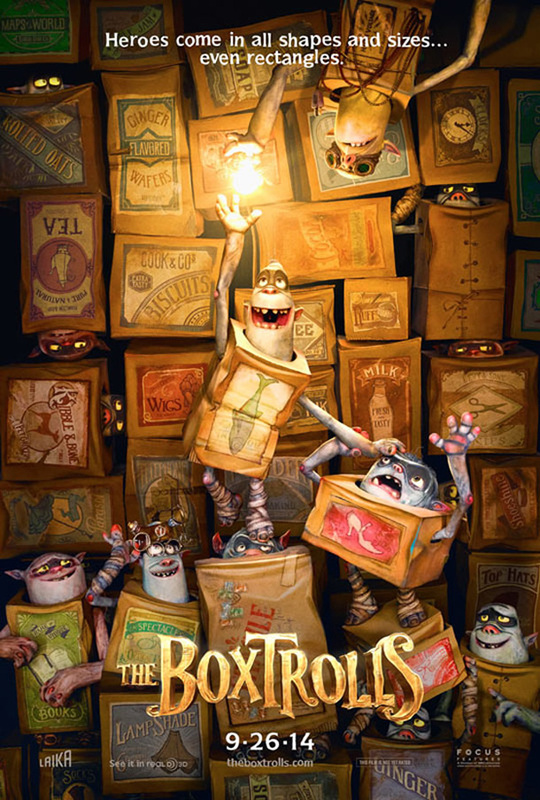 Focus will release The BoxTrolls, the latest stop-motion animated feature from Laika, on September 26, 2014 and today have premiered the first trailer and poster for the film, which centers on the titular monsters, living underneath the streets of Cheesebridge. Legend tells of the BoxTrolls as they crawl out of the sewers at night to steal what the townspeople hold most dear — their children and their cheeses. However, in truth, the BoxTrolls are a community of lovable oddballs who are raising as one of their own an abandoned and orphaned human boy named Eggs. When the BoxTrolls are targeted by a villainous exterminator who is bent on eradicating them, Eggs must venture aboveground to save them, where he teams with an adventurous young girl to save not only the BoxTrolls but the soul of Cheesebridge. The film is directed by Anthony Stacchi and Graham Annable and features a voice cast that includes Ben Kingsley, Isaac Hempstead-Wright, Elle Fanning, Jared Harris, Toni Collette, Nick Frost, Richard Ayoade, Tracy Morgan and Simon Pegg. Check out the poster and trailer directly below.